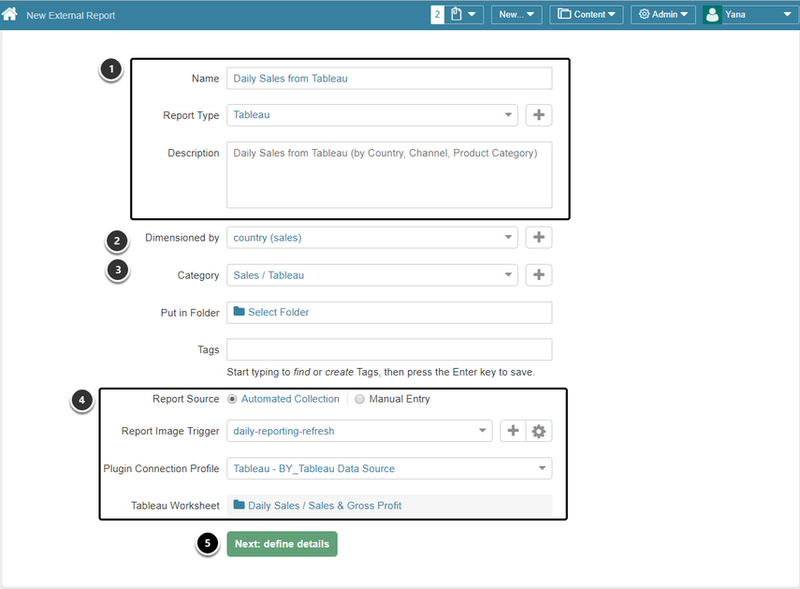 This article will guide you through the process of creating a Dimensioned External Report sourced from Tableau. Dimension: Before proceeding to creating an External Report, create a dimension with values collected from Tableau. As of Release 5.4.1, you can create a Dimension with Multiple Values. The Delimiter that you specify in the Tableau Data Source Editor must match the Delimiter you used when creating a Dimension with Multiple Values. Most of these fields will be completed based on your previous entries. Adjust as required. If your External Report is Dimensioned, you must map the Dimension you have used for this Report to the corresponding Tableau Filter (this External Filter is considered "required"). Otherwise, you will not be able to save your Report. Adding any other Filters is optional. 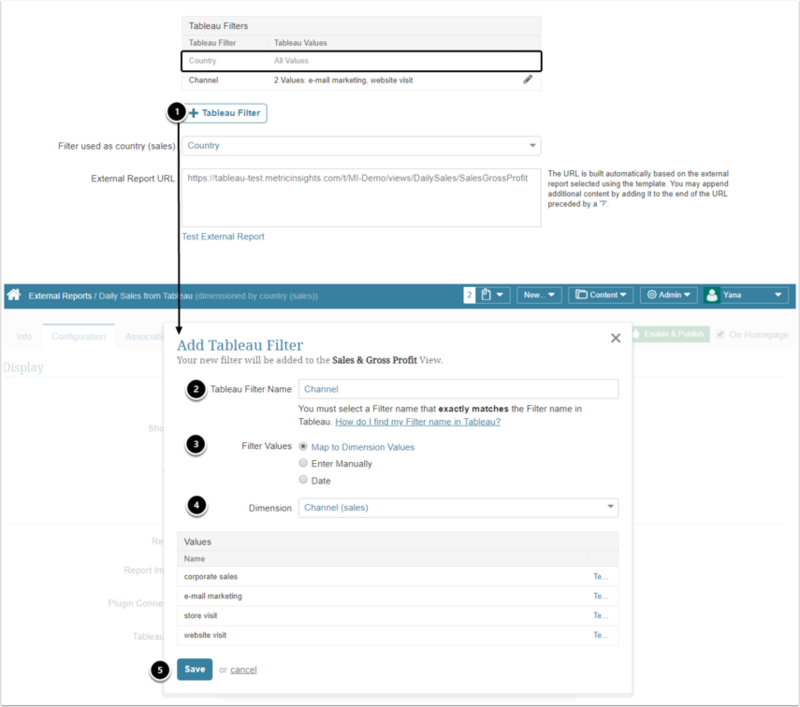 These Filters may be edited to allow the Tableau plugin to fetch data for all or selected Filter Values. On Demand: only when needed for distribution: Individual images are only collected when they need to be included in an email. NOTE: This setting is only available if the element is NOT made visible on Homepage. Click Save and collect image to create the Preview and Thumbnail images for display on the Homepage and Notifications. 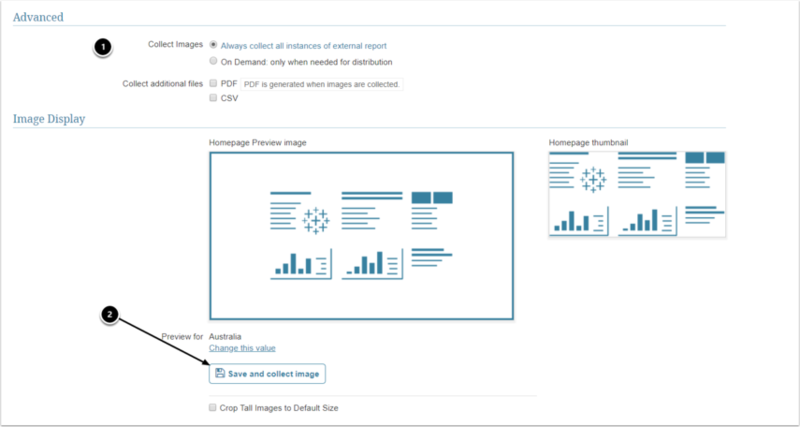 This step is required if you chose to display your External Report as a "Static Image" (if you do not collect image, nothing will be shown in Viewer). If you selected "iframe" display, you can omit this step. You now have a drop-down list above the External Report where you can filter to each particular Country or several countries at once (if you have configured a Dimension with Multiple Values beforehand).